Last evening, the Senate leadership released their $21.16 billion 2015 fiscal year budget for the period that runs from July 2014 to June 2015. Similar to the Governor’s budget proposal, the Senate proposal fails to take prudent steps that would put North Carolina’s budget on a more sustainable path. Likewise, it follows suit by leaving too many vital public services at diminished levels—failing to catch up with the needs of kids, working families, and communities five years into the official economic recovery. At this point, budget proposals that put the train on the wrong tracks should come as no surprise. Due to tax changes enacted last year, budget writers are constrained in major ways. We’ll call this a self-imposed budget challenge. State lawmakers created a structural deficit in which revenues are falling short of what is needed to meet critical needs across budget areas. The state is facing a revenue shortfall of $191 million in the 2015 fiscal year (not to be confused with the nearly half-a-billion shortfall for the current 2014 fiscal year that ends in June). The driver of these revenue shortfalls—despite an economic recovery—is the series of tax cuts that lawmakers approved and Governor McCrory signed into law last year that will drain available revenues to the tune of $437.8 million in the 2015 fiscal year. As we reported earlier this month, estimates suggest that the revenue losses from the tax plan, particularly stemming from the personal income tax changes, could reach $600 million in next fiscal year. Yet, rather than prudently recommending the halting of future tax cuts that are scheduled to go into effect in January 2015, the Senate—following in the Governor’s footsteps—chose to keep this next round of tax cuts in place despite the diminished revenue picture. We’ve said it once and we will say it again: North Carolina cannot afford to pay for tax cuts for the top at the expense of teacher layoffs, growing waiting lists for critical public services, and fewer dollars to support economic recovery across the state. State spending under the Senate’s proposal would continue to remain more than 6 percent below pre-recession levels, as illustrated in the chart below, even though spending over the base budget would increase largely due to Medicaid and pay increases for teachers and state employees. It’s clear that the misguided tax cuts are making it harder to catch up on lost ground. Provides nearly $530 million to boost the pay for teachers and other school personnel. There’s a catch. Only teachers who choose to forgo tenure are eligible for the pay raise. Otherwise, their pay is frozen at the current salary. Other school personnel receive either a step increase or a $618 to $1,000 salary and benefits increase. Provides a step-increase or across-the-board pay raise of $1,000 for other state employees. Provide a one-time $10 million appropriation to the Housing Trust Fund to pay for a Workforce Loan Housing Program. Sends nearly $43 million to the Rainy Day Fund and another $43 million to the Repair and Renovations savings account. Cuts $233.2 million in funding for Teacher Assistants to help pay for teacher pay raises. This is on top of the $110 million cut for the FY2015 that lawmakers already approved last year. Relies more on lottery dollars, and less on General Fund, to pay for teacher positions. Cuts the Department of Public Instruction by nearly $15.1 million, or 30 percent, and allows the department to decide where to make the cuts. Restores the master’s salary supplementfor teachers who hold advanced degrees. Cuts $38 million in funding to account for decrease in student enrollment for 2014-15 school year compared to previous school year. Provides an additional $3.9 million for small county supplemental funding. Phases out the Teaching Fellows Program as scheduled, saving $3 million. Provides $6 million to fund the Read to Achieve Program, which aims to ensure students can read proficiently by the fourth grade. Maintains funding for the NC Center for the Advancement of Teaching, with new report requirements on programs and outcomes. Funding was eliminated in the Governor’s budget. Creates the NC Education Endowment Fund (i.e. separate from the General Fund), which would be funded by donations and would be used to boost teacher pay. Include a fourth funding tier for high wage occupations with documented skill gaps resulting in a $16 million recurring increasing for community colleges. Included in the Governor’s budget. Funds financial aid for eligible veterans and dependents attending the community college system. Saves money because enrollment has declined by 2.5 percent. Directs the UNC General Administration to revise its Enrollment Growth Funding Model so that budget cuts to institutional support will not be limited when enrollment declines. The impact is a $5.3 million recurring reduction. Funds financial aid for eligible veterans and dependents attending the UNC system. Provides $2 million in non-recurring support for Union Square Inc, a non-profit entity creating a public-private partnership to build a facility in downtown Greensboro that will focus on health care education. Provides $206 million to fully fund the projected enrollment growth in the number of people eligible for the Medicaid Program, known as the “rebase.” Also provides $143 million to cover the projected Medicaid shortfall. Offsets these increases by making cuts within the Medicaid budget. Eliminates the automatic eligibility for Medicaid for older adults and people who are blind or have a disability. Saves the state $28.8 million. Makes other adjustments to Medicaid eligibility. Categorical coverage for recipients of the optional state supplemental program State-County Special Assistance is eliminated. And coverage for the medically needy is eliminated, except those categories that the State is prohibited. Requires prior drug authorization for mental health drugs, saving the state $6 million. Saves another $59.6 million by retaining a portion of the LME/MCO assessment and another $15 million by retaining a portion of the hospital provider assessment. Provider assessments help finance the state’s share of Medicaid costs. Instead of returning those assessments to Medicaid providers, the state is keeping a greater share of the fee. Also reduces the rates providers receive for serving Medicaid recipients. Provides $4.9 million to create a new organization that will house the Division of Medical Assistance to meet “critical objectives for Medicaid” and NC Health Choice. As such, the Division will no longer be housed in DHHS. Allocates $5 million in one-time funding to add approximately 1,000 slots to the NC Pre-K program. The Governor’s budget only added 700 slots but they were permanent slots. Also replaces millions of dollars of General Fund support (i.e. state support) for the program on a one time basis by relying on federal funding. Makes it harder for families to access child care subsidies by changing income guidelines and also increases the copayment that families pay at 10 percent of their income to help cover costs. Also disallows parents with part-time child care from being able to pay a lower, prorated rate. Cuts nearly $1 million from the Home Care and Community Block Grant for older adults despite long waiting lists and unmet needs that have piled up over the last few years. Provides $8.3 million to expand Child Protective Services in order to reduce the average caseload to 10 families per worker. Also provides $4.5 million to provide for child welfare in-home services. Provides $5 million to cover foster care assistant payments due to increased enrollment growth. Cuts $3.5 million in funding for school nurses and allows remaining nurses only in the state`s most economically lagging counties. Recommends a 2% flex to the Departments of Commerce and Labor, which allows the departments to determine where efficiencies can be achieved to reduce overall spending by $1 million on a recurring basis. Eliminates $637,500 on a recurring basis from the Division of Community Assistance, the office charged with administering the Community development Block—the federal-state partnership designed to provide resources for infrastructure, housing, and water/sewer lines in distressed communities. This provision eliminates 9.15 FTs, and shifts these dollars to fund the purchase and installation of a new grants monitoring and management software system as part of the state match. The additional portion of the state match will come from budgeting additional time on CDBG-related activities from existing staff members. Provides a non-recurring $364,000 reduction for the Job Maintenance and Capital Development Fund, the state’s incentive program designed to retain large-scale capital facilities. Several companies did not create the required number of jobs, and so the state’s payments to these companies were reduced by this amount. Budgets $500,000 in non-recurring receipts for the Common Follow-up System, which tracks former participants in the state’s education and job training programs. Eliminates the Limited Resource Communities Grant program in the Rural Economic Development Division, created last year to replace the assistance formerly provided by the Rural Center. This reduces the budget by $2.5 million on a recurring basis, and eliminates designated support for distressed rural communities. Provides $1.7 million in non-recurring funds for drilling test well and core analysis in the state’s shale gas basins. It also appropriates an additional $176,789 in recurring funds to develop and implement a regulatory regime for shale oil and gas in the state. Provides a total of $1.75 million in recurring funds to support cleaning up coal ash ponds in the state. Provides $2.5 million in recurring funds and $ 1 million in non-recurring funds to continue the clean-up of residential Leaking Underground Storage Tanks throughout the state. Provides a non-recurring $2.3 million increase to the Soil and Water Conservation Division to support agriculture water resource development projects. Transfers the State Bureau of Investigation and the State Crime Lab from the Department of Justice to the Department of Safety. Reduces administrative support for Indigent Defense Services. Eliminates the Access to Civil Justice Funds on a recurring basis. Eliminates fee that went to legal services. 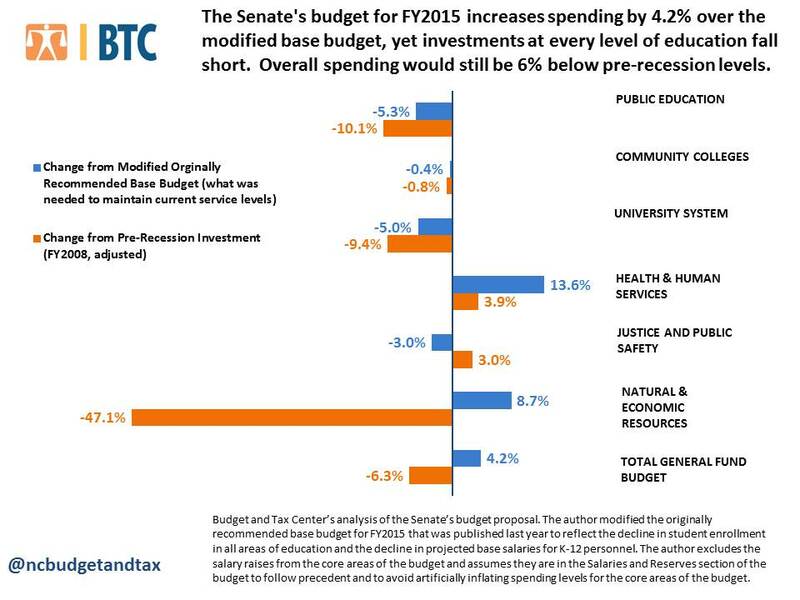 The North Carolina Budget and Tax Center is closely examining the Senate’s spending proposal. Stay tuned for further details as they develop. And tomorrow, we will break down the General Fund availability statement to give you an idea of how the Senate pays for its budget. Previous PostPoor, disabled and elderly facing major cuts in Senate DHHS budget proposalNext Post Environmentalists to NC House: Frack NO! Love that hysterical rhetoric “evicerate” is quite the word….did BlueprintNC feed that to you? That is right off their playbook.